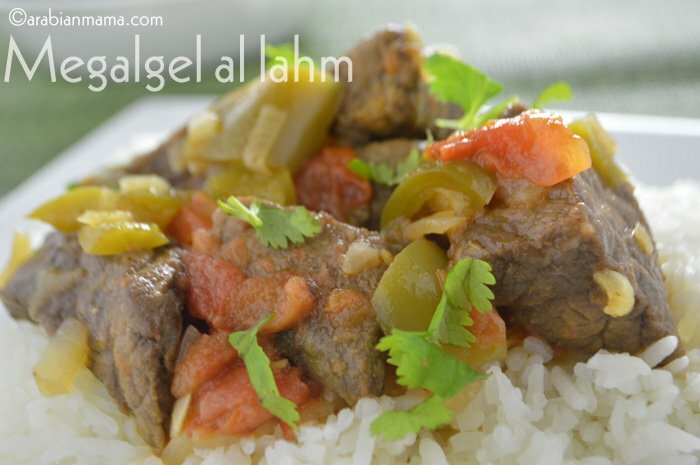 Simple and easy meat dish from Sudan and parts of the Gulf area. Served on a bed of white rice and seasoned with only salt and pepper… how easy?!! Have you recently watched the news in Egypt? It is getting crazy these days. Monday morning we woke up on the bad news that Egypt general prosecutor was assassinated , couple of days later ISIS bloody attacks in Sinai. 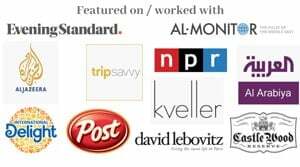 These were a lot for my kids to digest, they kept asking questions that I had no answers for. How am I supposed to explain such brutality , hatred, wave of violence to their innocent hearts!!! Regardless of your approval of the current regime in Egypt or not, these acts are unjustified no matter what. 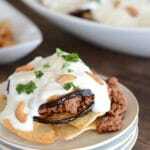 In these crazy days everybody is glued to the screens waiting for the news and scared of what will come next, so we need easy ,yet delicious recipes to serve in our iftar table. Although I have heard that this recipe is common in Eid- which comes after Ramadan-, it is still very suitable anytime of the year. 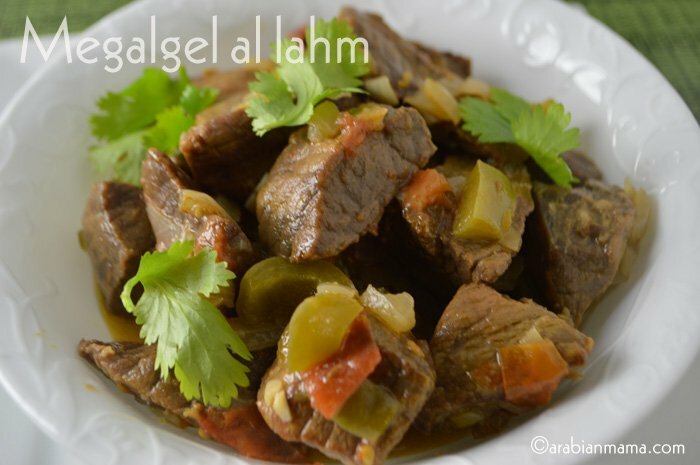 Megalgel al lahm is a popular recipe in Sudan and some parts of the Gulf area, but I’ve never heard of it in Egypt. It is usually made with lamb meat that is browned in lamb fat but for my family’s high intolerance for lamb, I’ve made this with beef stew and used olive oil instead of the lamb fat. 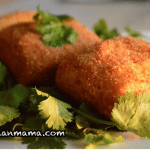 Recipe for this dish varies as some people do not add tomatoes and just use tomato paste, others do not add green bell pepper and many others use difference spices. For me adding the cubed tomatoes is way better than the paste, throwing some cubed bell peppers or -if you are adventurous some chili peppers- is crucial for the taste. Salt and black pepper are all what this recipe needs. Using garlic is totally optional, so as you can see this recipe is very forgiving and will turn out great anyways… awesome. 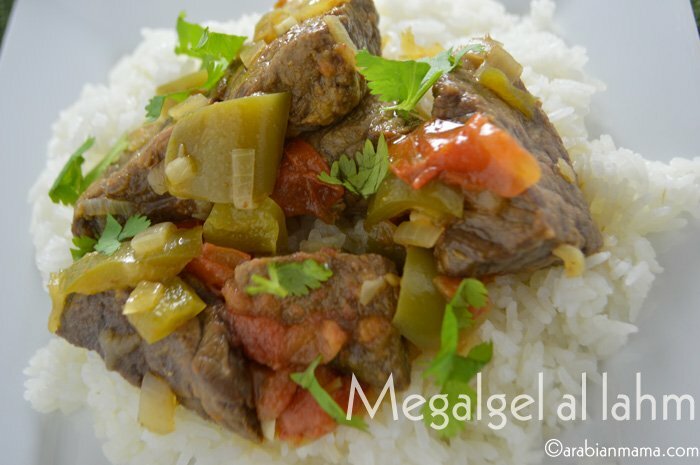 Here is a short video on how to prepare megalgel al lahm. Salt + black pepper to taste. 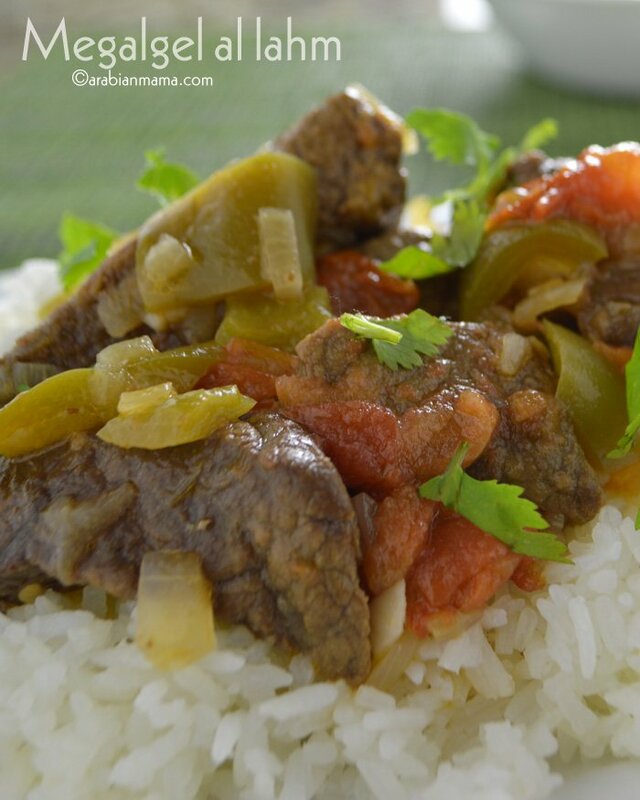 * In this recipe I’ve used beef stew but authentically this dish should be made with lamb stew. Heat oil on medium high to high heat. Stir to brown the meat. Cover and let it until all the water is evaporated. Add the diced onion and the minced garlic. Stir until onion is translucent. Add the cubed bell pepper. Salt and black pepper then cover and let it cook. You may want to add 1/2 c of water if you feel it is dry. Served on abed of white rice or with flat bread. The stew looks womderful! I don’t lamb either so I’m glad I can use beef! Your dish looks delicious…I could eat this anytime! 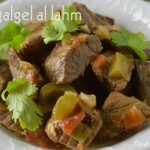 Love lamb, and I make a lamb stew with green beans called Lubee. It was something my grandmother made. Similar to yours. It is a terribly sad world we live in…so much hatred. I just don’t understand why people are so cruel to their fellow brothers and sisters. Is garlic ever really optional? 😉 Lovely dish — I can never resist lamb. And so much of the news throughout the world is just awful at the moment, isn’t it? Anyway, such a great recipe — thanks. You are so right no one deserves massacre or hatred at all. So hard to try and explain to kids. At least food can bring some comfort and this is the dish to do it, looks so good and satisfying.